LUXEMBOURG — U.S.-Turkish tensions escalated Saturday after a quashed coup in Turkey, as the country's leader bluntly demanded the extradition of a U.S.-based cleric he accused of orchestrating the violence. Another senior official directly blamed the United States. After strongly supporting Turkish President Recep Tayyip Erdogan when it seemed his government might topple and then opening the door to sending home the cleric, a stung Obama administration fired back at its NATO ally. "Public insinuations or claims about any role by the United States in the failed coup attempt are utterly false and harmful to our bilateral relations," U.S. Secretary of State John Kerry told his Turkish counterpart, according to the State Department's readout of their telephone call. The back-and-forth occurred against the backdrop of Turkey closing its airspace, effectively grounding U.S. warplanes that had been targeting Islamic State forces in neighboring Syria and Iraq. At the center of the controversy stood Fethullah Gulen, who lives in exile in Pennsylvania and promotes a philosophy that blends a mystical form of Islam with staunch advocacy of democracy, education, science and interfaith dialogue. Gulen quickly condemned Friday night's coup attempt by military officers that resulted in a night of explosions, air battles and gunfire that left dozens dead. Erdogan's government said Gulen directed the coup all the same. In a televised speech Saturday, Erdogan said Turkey had never rejected a U.S. extradition request for "terrorists." Addressing Washington, he requested the handover of Gulen and said, "If we are strategic partners, then you should bring about our request." 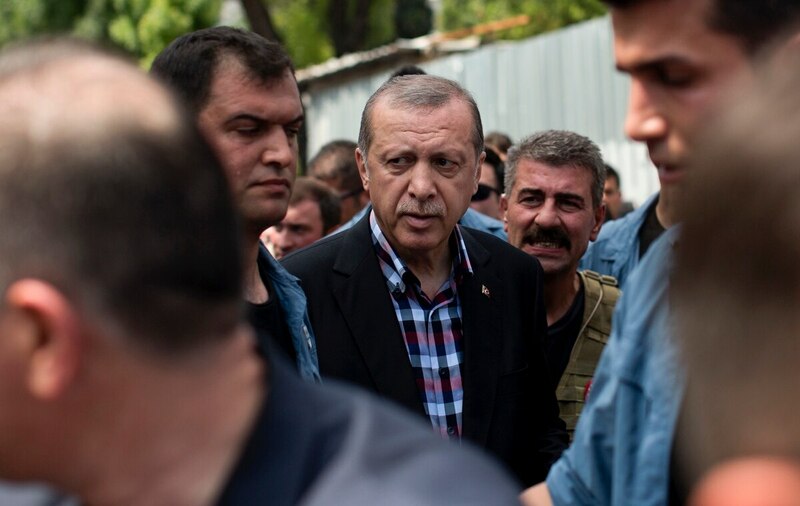 Although he didn't outline any threat, Erdogan's emphasis on U.S.-Turkish counterterrorism cooperation raised the prospect of a prolonged closure of the Incirlik air base in southern Turkey if he didn't get his way. The Pentagon said it was trying to get permission to resume air operations from the base, while adjusting mission operations in the meantime. Suleyman Soylu, Turkey's labor minister, went further than Erdogan, suggesting the U.S. was behind the coup. In their second call in as many days, Turkish Foreign Minister Mevlut Cavosoglu told Kerry the government was in control of state institutions. At a news briefing Saturday in Saylorsburg, Pennsylvania, the cleric noted that he has been away from Turkey for more than 15 years and would not have returned if the coup had succeeded. He cited greater freedoms in the United States as a reason. "In brief, I don't even know who my followers are," the frail-looking cleric said through an interpreter. "You can think about many motivations of people who staged this coup." The coup failed after appearing not to have been backed by the most senior ranks of the military. Turkey's main opposition parties, too, condemned the attempted overthrow of the government. Prime Minister Benali Yildirim said 161 people were killed and 1,440 wounded in the overnight violence. He said 2,839 plotters were detained.